When builder Terry Hutchinson decided to build a home in Portland, Oregon's 2012 NW Natural Street of Dreams, he pulled in architect and designer Mark Stewart to help complete the vision; they settled on inspirations from Leonardo Divinci as the design theme. Next they called upon tile installer Chris Campbell and tile artist Randy Hopfer from Tile Surface Impressions to create key design features for the home, including a 40"x40" porcelain tile mural of Divinci's La Scapigliata. 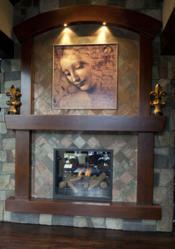 A design with large open beams and crafted stonework present the Divinci home as the premiere home of the 2012 Portland, Oregon Street of Dreams; a 40”x40” porcelain tile reproduction of Leonardo’s portrait of a woman’s head graces the entrance to the home, setting a soft inviting tone amidst strong architectural elements. Builder Terry Hutchinson of Hutchinson Home Builders is passionate about every detail of his projects and worked extensively with architect Mark Stewart of Mark Stewart Home Designs in Portland, Oregon to create a masterpiece Leonardo himself would be proud of. Details and thoughtful architectural spaces are the secret of this design; aligning with Leonardo’s Canon of Proportions which inspired Marks’s work and led to the tile mural of Leonardo’s Vitruvian Man in the great room. The entry way tile mural was produced by Randy Hopfer owner of Tile Surface Impressions in Vancouver, Washington; Hopfer created this mural using imported 20”x20” Italian porcelain tile; four tiles make up the 40”x40” porcelain artwork creating an intriguing focal point as you enter the home. Surrounding the mural is a field of impressive slate designed and installed by Chris Campbell of Campbell’s Tile Concepts in Portland, Oregon. The tile work is framed with stately wood beams that grace the architecture throughout the home. Architecture, art, and science come together with inspiration and passion to create this truly Divinci inspired living space. Mark Stewart’s vision inspired by Leonardo Divinci's work is evident throughout the home; view the web site. Hutchinson Home Builders strives for quality craftsmanship of high end residential and remodel projects. Based in Portland, Oregon they have completed and work on projects around the State of Oregon. Mark Stewart Home Design has been in the business of award winning custom design and stock home provision since 1988. Mark Stewart has worked as a guest designer for the Emmy award winning Extreme Makeover Home Edition, as well as pioneered the “Lifetime Homes” program for Easter Seals along with a long and distinguished career as a custom home design leader worldwide. Campbell’s Tile Concepts is a company founded by Chris and DeAnna Campbell in 1997. Chris is a second generation tile setter with over 25 years experience and Deanna has over 20 years management and project coordination experience. We specialize in old world craftsmanship, focusing on high end installations. Our team consists of long term employees who are solutions oriented and forward thinkers who will greet you with a smile. Whether you are a designer, builder, or the end user, make us a part of your team. From concept to completion we look forward to making your project a reality. Tile Surface Impressions, a nationwide supplier of custom tile finishes including artwork on tile and supplies custom designed tile direct to architects and designers for commercial and public art. By reproducing original art or designs in ceramic, glass, and porcelain tile they allow designers full control of solid surface finishes; Tile Surface Impressions’ art on tile process and custom design services also support donor and legacy wall fundraising projects.